Fishmaster T-tops: Comfort and Convenience – just how you need it! Do you love to spend time on the water fishing for the big one? I do! But the heat can be intense, making you wish for some shade. You can now easily add shade to your boat, keeping a comfortable temp while you navigate the waters. The Fishmaster Folding T-Top is perfect for every fisherman. Providing shade and storage while folding out of the way when not in use. The Fishmaster T-top is a fisherman’s dream come true! This T-top is versatile in many ways. Made from Sunbrella material, providing the best UV protection available, keeping you cool and energized for a full day of fishing. You can also add the adjustable fishing rod holders to keep your rods organized and out of the way while not in use. But that’s not all! The Fishmaster T-top can be accessorized with an electronics box. This is a lockable storage box that mounts under the top, keeping all your electronic devices such as your phone and radio, dry and safe. Another amazing feature with the Fishmaster top is the unique design that allows the T-top to fold down. This feature allows you clearance when storing on a dry dock, in your garage, or even under certain bridges. It is quick and easy to fold the t-top down, using only a few simple steps. By now I know you’re asking yourself why you don’t have a Fishmaster T-top. Well, ask no more and give us a call. 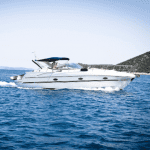 We can help you get the right T-top for your boat. 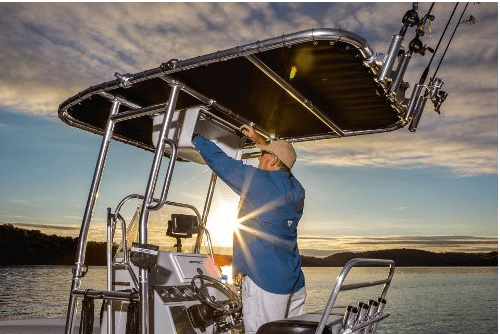 Next: The PWR-ARM Bimini Top – A Great Addition!